For a guy who can’t see, Dennis Atkins has quite the vision. Dennis, a customer care center branch manager in St. Louis, wants to start a foundation to help young disabled people get an education so they can live independently and be self-sufficient. “That’s my dream, to someday establish a foundation that would provide scholarships for that,” he says. “I’d like to raise $88,000 a year, so each of the 22 independent living centers in Missouri could provide a $4,000 scholarship to a deserving student. Dennis runs side-by-side with a companion with the help of a special running rope designed by Susan Caudle, a physical damage claim desk manager in St. Louis, and her husband, Mike. The clothesline-like rope is about two feet long with knots on each end that Dennis and his companion hold onto. So to advance his cause, Dennis will run from Jefferson City to Columbia, Mo., Saturday and Sunday morning. It’s a 35-mile trip called the “Road Trip to Independent Living” that will include a couple of laps around the Missouri State Capitol. On the Capitol laps, he’ll be joined by 42 kids – some in wheelchairs – who play in a baseball league for kids with disabilities. “Whether you have a disability or not, we all face challenges, and we mustn’t give up,” says Dennis. “The purpose of the run is to demonstrate to the community that people with disabilities have a lot to give, we just have to do it a different way. The run, which American Family helps sponsor, will lead Dennis to a statewide independent living conference where 300 independent living staff members get together for training and to share ideas. Dennis is on two governor-appointed boards in Missouri; one of them is the Missouri Statewide Independent Living Council, which oversees the 22 independent living centers that help train care providers, and build wheelchair ramps and wider doors so people can continue to live independently in their homes. Two years ago he was the keynote speaker at this conference. A few others will join Dennis on his jaunt. One is a 71-year-old man who will roll in his manual wheelchair with Dennis, 55. Dennis also expects a dozen or so bicyclists and a handful of runners. Dennis plans to wrap up Saturday’s portion of the run by noon to avoid the heat of a Missouri summer afternoon. He wants to get at least 20 miles in that day. On Sunday morning, Dennis and his group will be met by representatives of each of the 22 independent living centers who will join him for the last 1.8 miles before they get started on their conference. He’s going to offer to bring his road trip to each of the 22 centers. Then he’ll have a fund-raiser on a track where people can run, walk or roll to raise money. As we said, for a guy who can’t see, Dennis Atkins has quite the vision. 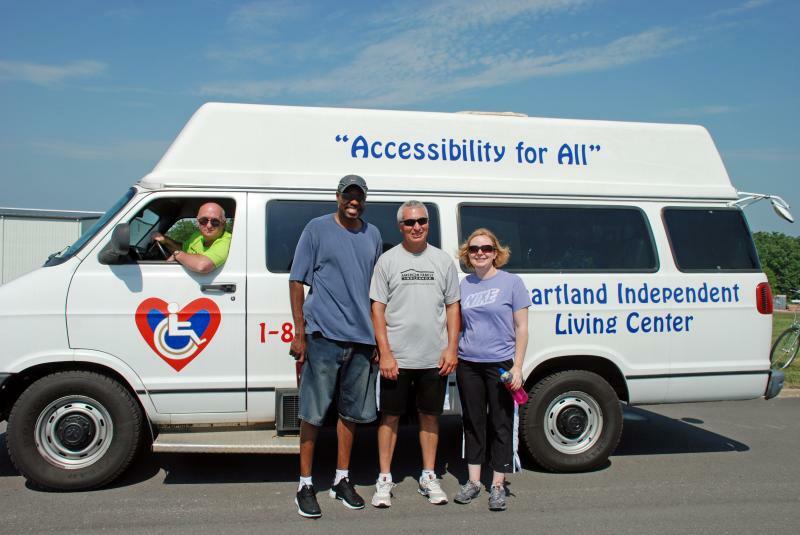 Dennis Atkins is doing the “Road Trip to Independent Living” to raise awareness, not money. But we know some of you will want to support his cause financially. If you’re so inclined, we ask that you contact Dennis at dennis@dennisatkins.com. The “Road Trip to Independent Living” is an opportunity for anyone in your area to join Missouri Statewide Independent Living Council member Dennis Atkins and former Council member Joseph Matovu on Saturday, July 9th and Sunday, July 10th as they travel from Jefferson City to the Columbia, finishing the approximate 34 mile trip at the Courtyard by Marriott, once again the site of the I.L. Summit. Dennis is a marathon runner who happens to be blind. Joseph will be covering the distance in his manual wheelchair. We invite everyone; walkers, runners, wheelchair users, bicyclists, anyone interested, to join in this new event designed to create awareness for the abilities of Missouri’s disabled community, and also for I.L. Summit 2011. Participants can take part in as much or as little of the event as they wish.